New heating system reduces CO2 emission by 600 tonnes! The old electrode warm-water boiler at the RWE Regional Centre, Münster, had seen better days. It was no longer technically up to date, and with its large buffer storage tanks, it took up too much space. An overhaul of the heating system was therefore the obvious course. 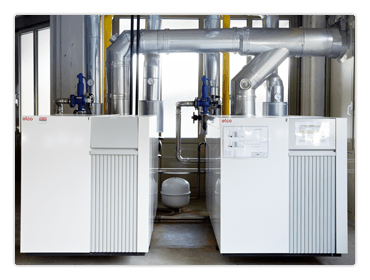 ELCO’s solution: two cascaded RENDAMAX 3602 gas condenser boilers. The result is a reduction of the CO2 emission by 600 tonnes a year! A further benefit: the new double-boiler system takes up only 80 m2 of floor space, instead of 600 m2. An ideal solution was also found for the financing. The heating contractor, RWE Energiedienstleistungen GmbH (ED), finances and operates the system and undertakes the maintenance and repair. Bottom line: the customer RWE has no investment costs, does not have to take risks, and receives the latest technology plus reliable service.